Up to $500 for Doing Home "Work"
The energy-efficient home upgrades tax credit is scheduled to expire on December 31st this year. If you need to make improvements to your home, this could be an incentive to do it before the end of the year. If you have already made qualifying improvements without realizing the tax credit is available, it may seem like a holiday gift you weren't expecting. The equipment must be installed to qualify for the credit which can put you under a time crunch. Heating and cooling systems, insulation, windows, doors, skylights, water heaters and home weatherization may qualify. The Residential Energy Efficiency Tax Credit has been available for purchases since January 1, 2011. The tax credit is 10% of up to $5,000 of qualifying improvements which would make a maximum of $500 tax credit. The cumulative maximum amount of tax credit that can be claimed by a taxpayer in the different years this law has been in effect is $500. If it has been claimed in previous years, the taxpayer is not eligible for this credit for additional new purchases. For more information, see energy.gov or talk to your tax professional. Transferring the title of a home from one person to another may seem simple but it could have a significant tax implication. When a person inherits property, the basis is "stepped-up" to fair market value at the time of the decedent's death. On the other hand, a gift has a carry-over basis which means that the recipient receives the unrealized gain also. As an example, let's say an elderly parent, in an attempt to get their affairs in order, gives their home to their adult child. The rationale might be that they are the sole beneficiary and will get the property eventually. In an effort to settle things early, unnecessary income tax may be incurred. If the home was purchased for $20,000 and worth $100,000 at the time of transfer, there is a possible gain of $80,000. However, if the adult child inherited the property at the time of the parent's death, their new basis would be $100,000 or the fair market value at the time of death and the possible gain would be zero. This is meant to be an example and many other variables could be involved. If you're concerned about a situation, you should seek specific advice from a tax professional. As always, I'm here to help you I can as your real estate professional. Forget Macy's and Crate & Barrel. Set up your bridal registry at the bank and use the funds for the FHA down payment on a home. This could be perfect for people getting married who already have their household items and really need help getting into a home. FHA has had this little known program that allows cash gifts since 1996. Sellers, builders, real estate agents or anyone with a financial interest are restricted from making a gift contribution. It's not difficult to set up and it's available with any FHA lender. 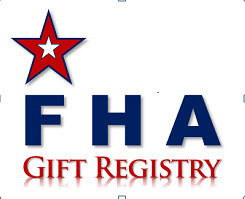 Inform your mortgage professional early of your intention to obtain all or part of your down payment from gifts to the FHA homeowner bridal registry. Open a savings account at your bank named "bridal registry account"
Gift registries are commonplace and really benefit both the giver and recipient. Etiquette websites like Emily Post state that alternative registries are acceptable. Couples are now suggesting to friends and family that they want help with their honeymoon, education or furnishing a home. Interestingly, this program is not limited to people intending to be married. It is available for other situations where gifts are typically received by individuals. Other occasions could include graduation from college or graduate school.